Sparks, Nevada. December 23, 2013. Sierra Nevada Corporation (SNC) has successfully completed the second Dream Chaser® Space System (DCSS) Integrated Systems Safety Analysis Review, marking the company’s completion of NASA’s Commercial Crew Integrated Capability (CCiCap) initiative Milestone six. This critical safety review evaluated not only the Dream Chaser spacecraft, but also the launch vehicle, vehicle integration and the ground and mission systems, which comprise the entire DCSS. Milestone six represents a major step forward in the maturation of the systems safety and reliability analysis, which is critical to achieving a safe and effective design of the DCSS. During the milestone review, SNC provided NASA with significant and detailed systems safety analysis products including hazard analysis and failure tolerance analysis of the entire DCSS. Dream Chaser builds on NASA’s extensive human spaceflight heritage by adopting key lessons learned from programs such as Apollo, the space shuttle, the International Space Station, and Constellation, in the design and operations of the DCSS. The first DCSS Integrated Systems Safety Analysis Review was held in early 2013, providing NASA its first look at the DCSS safety and reliability analysis products. Since that time, SNC has worked closely with NASA to find opportunities for improvement, and has made significant updates to the design of the vehicle aimed at improving safety and reliability. SNC is working with NASA’s Commercial Crew Program to develop a next-generation crew transportation vehicle. Dream Chaser is the only reusable, lifting-body human spacecraft with a commercial runway landing capability, anywhere in the world. 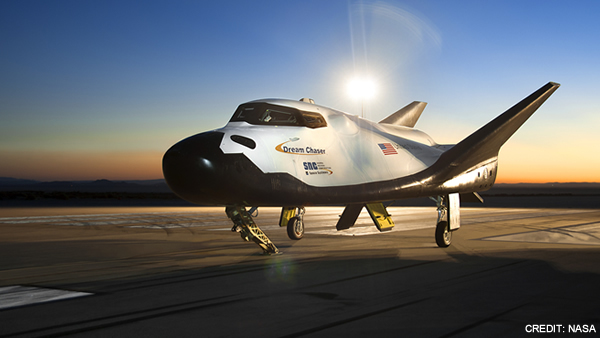 The Dream Chaser spacecraft is on the forefront of the commercial human spaceflight industry, offering safe, reliable and cost-effective crew and critical cargo transportation to low-Earth orbit.